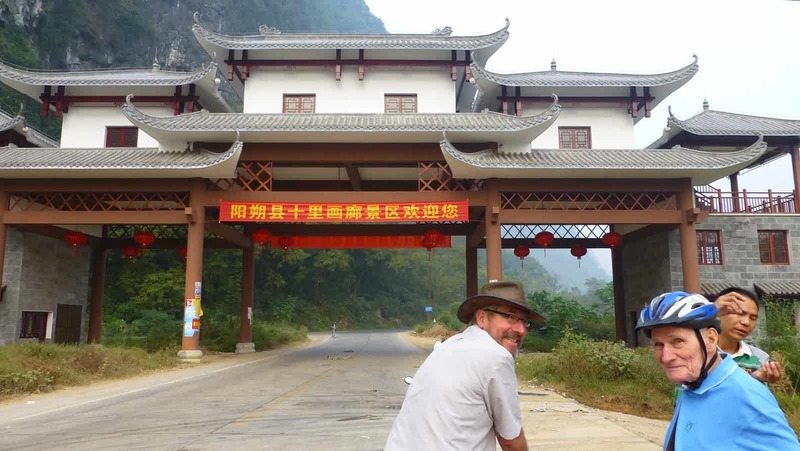 What a great introduction to China. 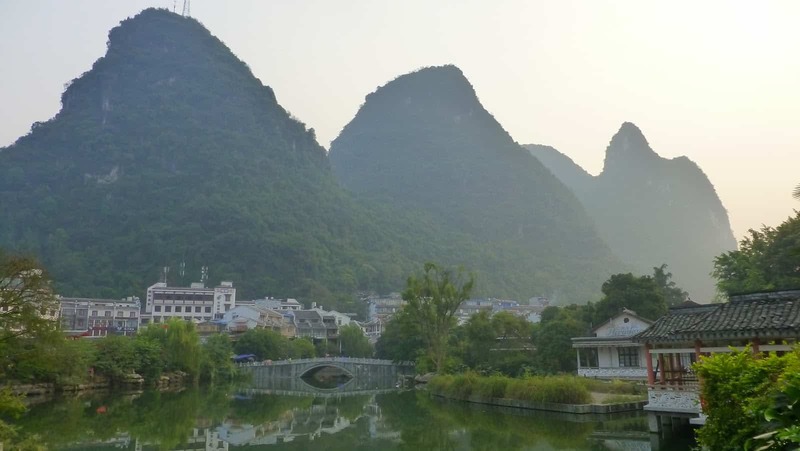 A couple of nights in beautiful Yangshuo. 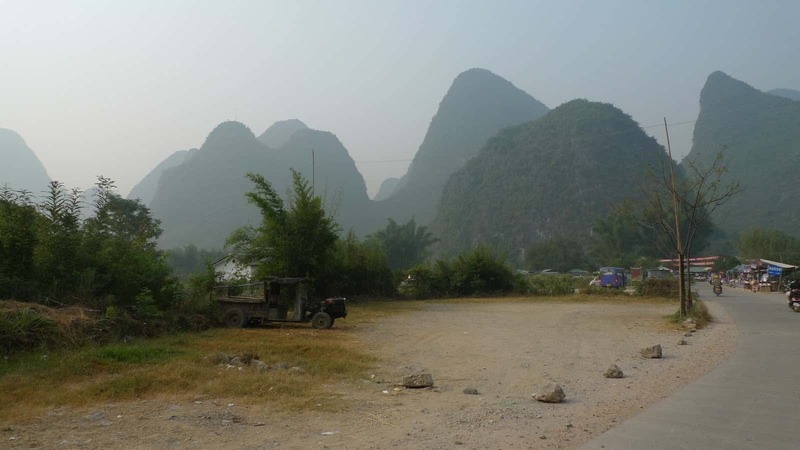 This was one of my favourite places in China. 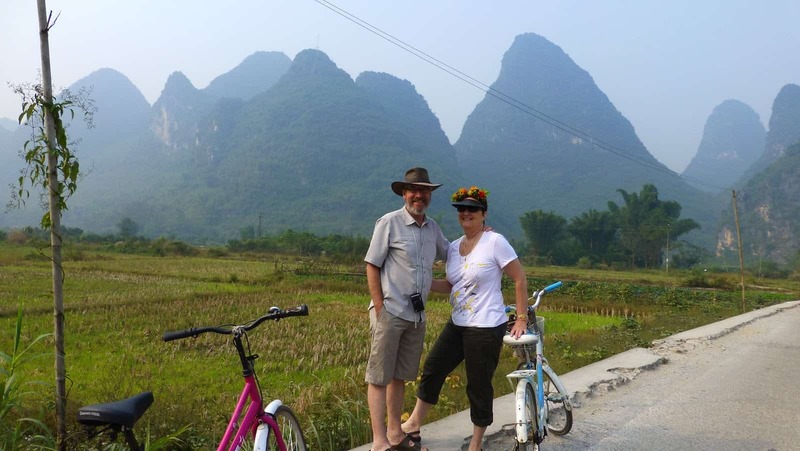 Here in Yangshuo we had the opportunity to experience a bit of China countryside by hiring bicycles and taking off for hours along rugged dirt roads. 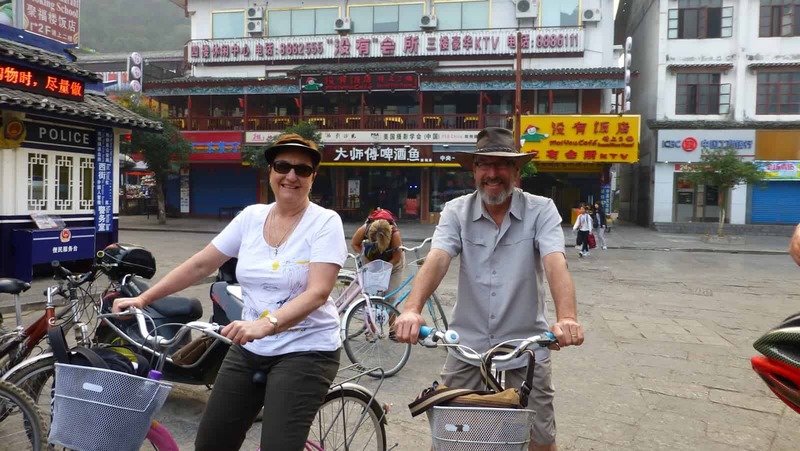 Dave was very skeptical about my ability to stay on a bike, given my humiliating experience he witnessed many years ago. That was the only time he’s seen me attempt to ride a bike so he felt quite justified in his non-belief. Anyway I knew I could do it, so after a wobbly start around the quiet street we set off on our huge day of discovery and wonder. Our local guide Daniel led us through beautiful country roads and lane ways as well as negotiating some really scary busy roads. 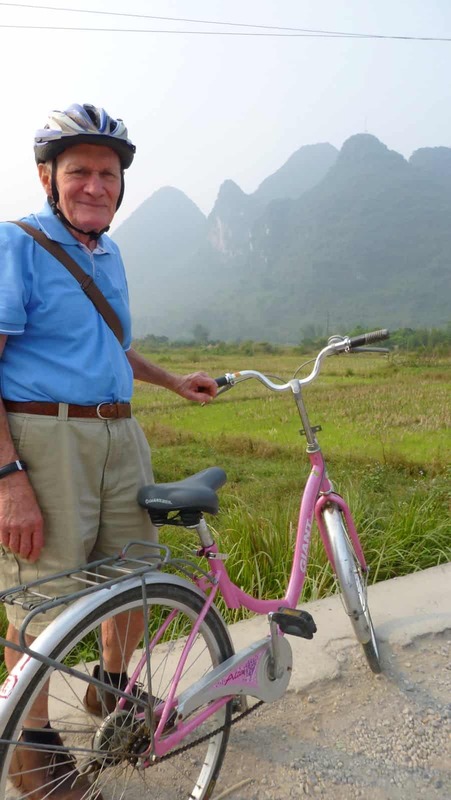 Don’t you think I look very capable on this bicycle? 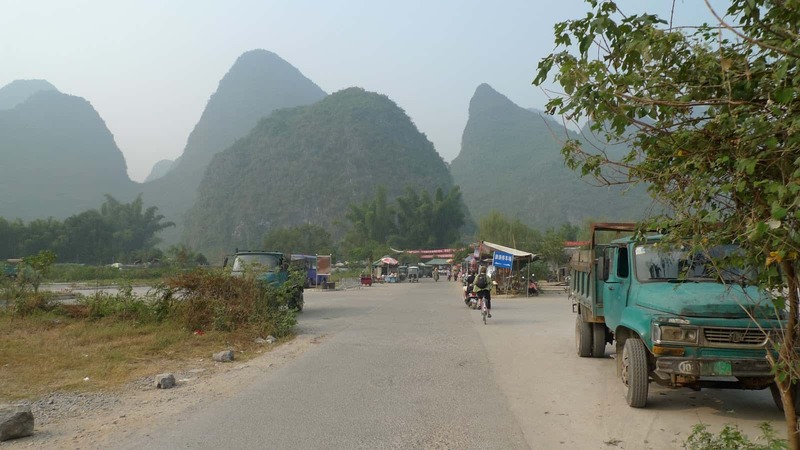 The sign says something like “welcome to the beautiful Yangshuo countryside road”. The road has some kind of Heritage listing, but I wasn’t paying enough attention. Too busy trying to remain stable without anyone noticing. 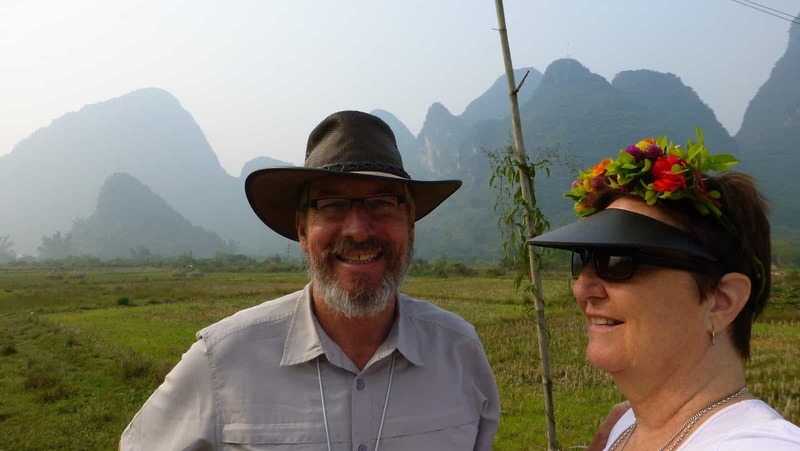 The very beautiful head wear, with mountains. That very flattering floral head band you see me wearing was purchased from a local peasant who made it herself using fresh flowers. 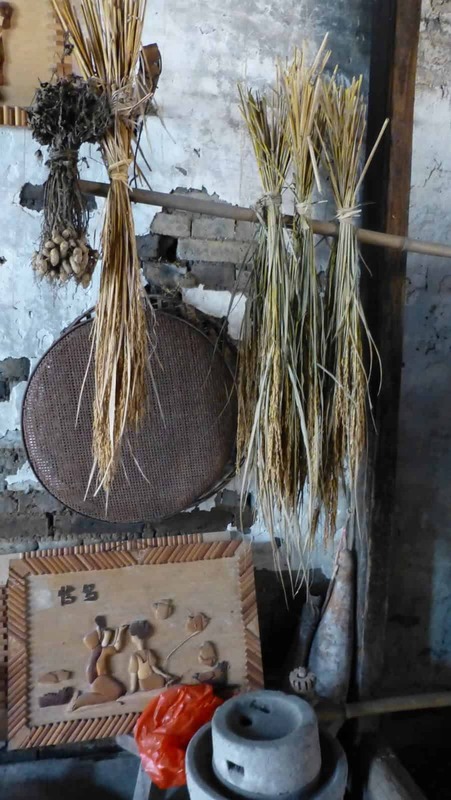 We found many of these works of art for sale by the women of Yangshuo’s surrounding villages. The locals would smile and wave at me when they saw me wearing it. I wonder if they just thought I looked ridiculous and were laughing at me, not with me. Well I liked it. The peddles on Dave’s bike were in the shape of a flower. Wished I’d taken a photo of them, it was really funny. Biker fiend. Luckily no lycra today. This and so much more on our bike ride. Breathtaking. Through a village. Something beautiful to see every day. 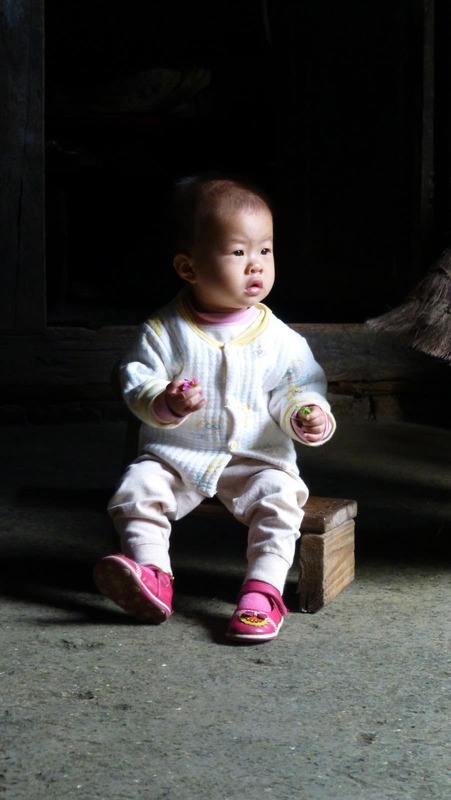 We stopped at a small village and Daniel arranged for us to visit a woman and her granddaughter in their traditional house, over 200 years old (the house, not the woman). Fascinating. The living room. There is a typical raincoat hanging on the wall. The majority of these items are from previous generations and centuries. This woman lives a very simple and humble life. Plus she has to parent all over again…. 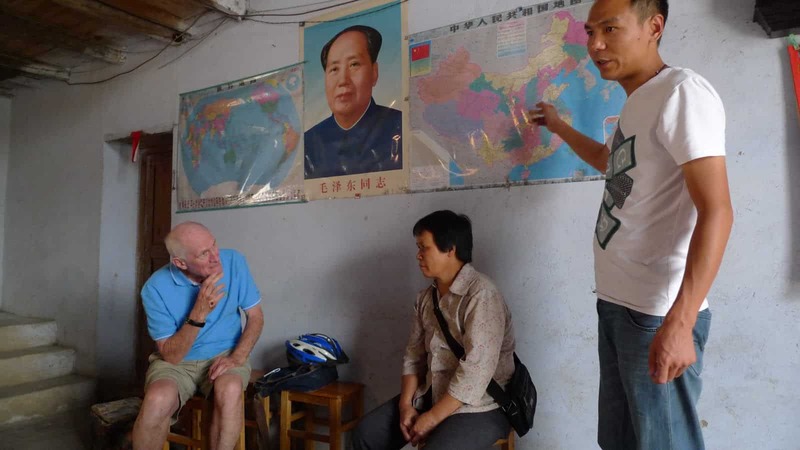 An old poster of Chairman Mao still taking pride of place on the wall. Hard earth floor. Original kitchen and “appliances”. In the back room was a coffin, ready for when the lady dies. Apparently they like to be prepared for these things. The woman was caring for her granddaughter while her son and daughter-in-law worked away in the city. The son comes home to the village on weekends. A tough life for some. The house will transfer to her son when she passes away. But they will never own the land the house sits on. 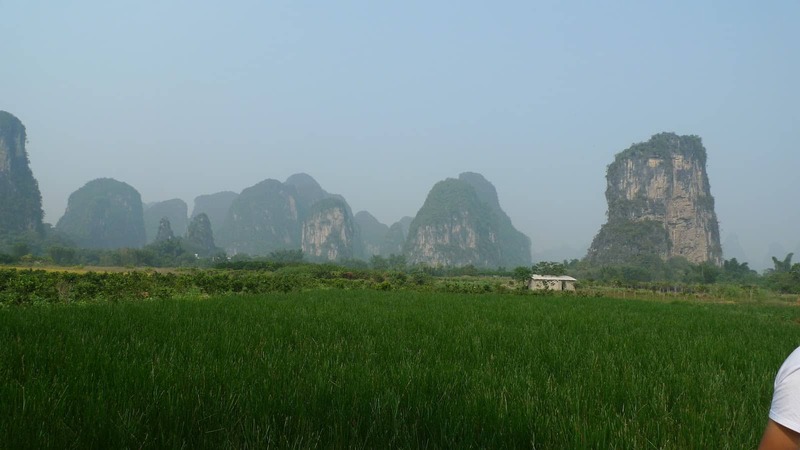 Along the way we rode past rice paddy fields, lotus flower pastures and fruit groves, always surrounded by those fantastic mountains…. Yet another privilege was lunch in another village, in the home of a woman who actually cooked food for us and gave us some insight (via Daniel’s interpreting) into living in the countryside. 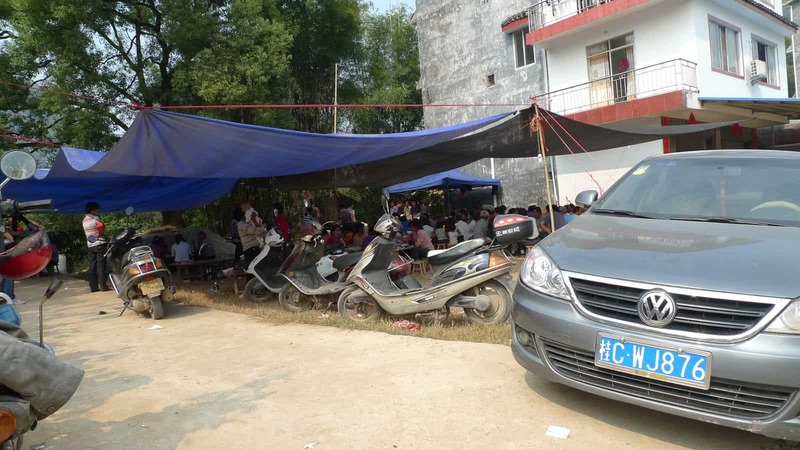 We all sat around a table while she brought dishes of deliciously simple vegetables and meat. We managed to polish the whole lot off and didn’t go away hungry. I was so busy eating and enjoying the company that I completely forgot to take photos of the food. But here’ a general look around her space. 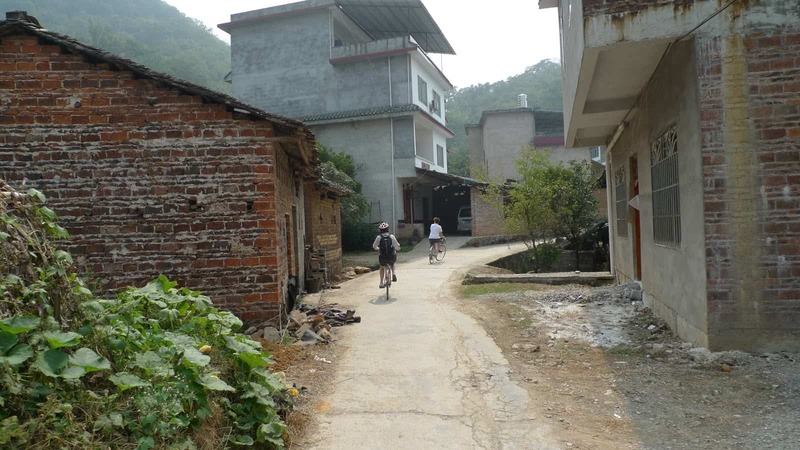 Parts of the village are being developed for home-stay accommodation. 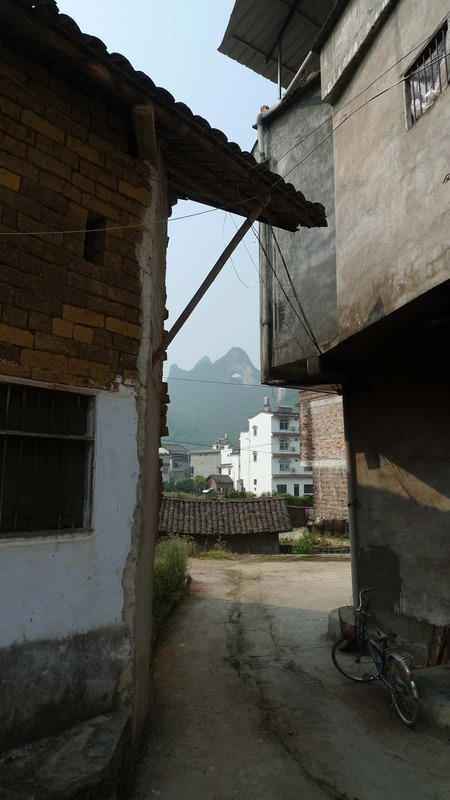 The Chinese government is very supportive of tourism in regional areas and doesn’t seem to discourage the construction of rather unattractive hostel type buildings. 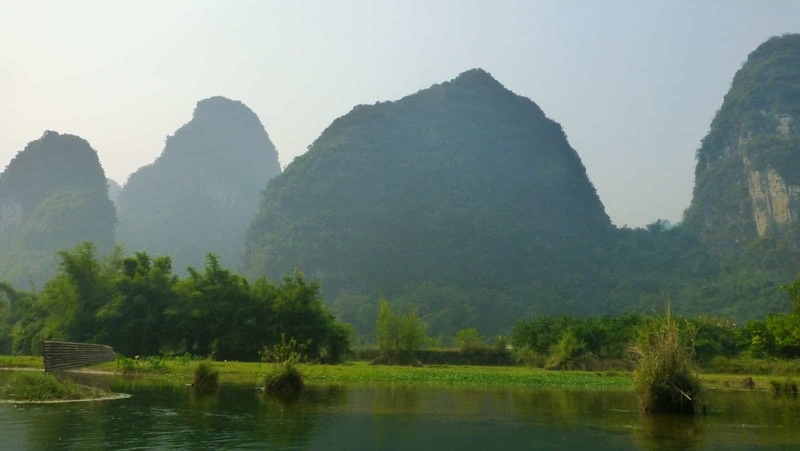 There’s much more of Yangshuo to come. Love the pics – looks awesome!